New and returning Laurier students will experience an improved online experience this year with the launch of students.wlu.ca. The new website was launched in August as a portal to everything Laurier students need to access during their academic year — from program requirements and career services to information on intramurals. Among the defining features of the new website is the ability for students to personalize their preferences based on, for example, their campus location and level of study. The new website is designed to make the student user experience seamless. 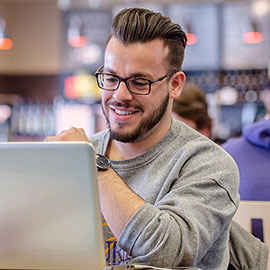 By logging in through the My Laurier tab using their @mylaurier credentials, students can update their preferences to select which content first appears as they navigate the site. Students will have quick and easy access to their timetables as well as information on upcoming Laurier events. Students can also access their webmail, MyLearningSpace and library accounts once signed in to the new website. To make pertinent information more readily available to students, a variety of student-focused What You Need to Know articles will appear on the website throughout the academic year to address frequently asked questions or processes and information — ranging from how to register for courses to applying to graduate. The web team’s efforts to design and launch the new current students website, a major initiative under Laurier’s web renewal project, was undertaken in close consultation with the Laurier community — including close to 1,000 students and two advisory groups drawn from staff and faculty. We designed the current students website based on what students wanted to see and how students wanted to find it, but we know it will take a bit of time to get used to! Are you a current student? Check out the MyLaurier tab on students.wlu.ca to find your quick links, including: webmail, My Learning Space, LORIS, the library and academic dates. The fall term fee deadline is Aug. 25. Looking for the link to pay your tuition? The website project team also included members of the Laurier student body, including Content Entry Coordinators Kevin Lee and Tyler Gwynn, who supported testing of the new website and contributed greatly to the rollout of online forms. "I believe that the new student website is a reflection of Laurier’s commitment to continuously enhancing our student user experience,” says Lee. “I am proud to have taken part in this opportunity to enhance not only Laurier’s online presence but also something that my peers will use on a daily basis." Part of the team’s work included making sure students.wlu.ca was optimized with responsive design features — an important acknowledgment that students are increasingly using a variety of devices, such as smart phones, to access online information. This optimization effort also includes ongoing clean up of outdated content to improve the quality of search results. The next phase of Laurier’s web renewal project will deliver a faculty- and staff-focused intranet, followed by decommissioning Laurier’s legacy website.